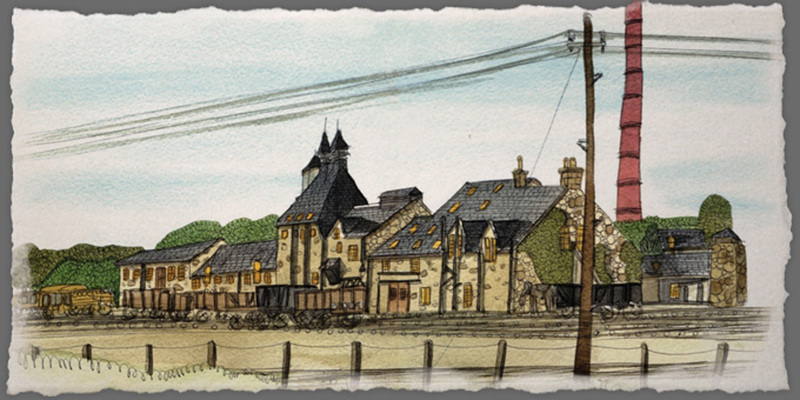 Towiemore Distillery began life during one of the whisky industry’s brightest periods and produced through its worst. Built in 1897 in the parish of Botriphnie just outside of Dufftown, Towiemore distilled for just thirty years. In this time it garnered a fine reputation as an excellent pure malt whisky. Owned and supported by renowned whisky entrepreneur Peter Dawson, Towiemore was a victim of bad luck and ill circumstance. 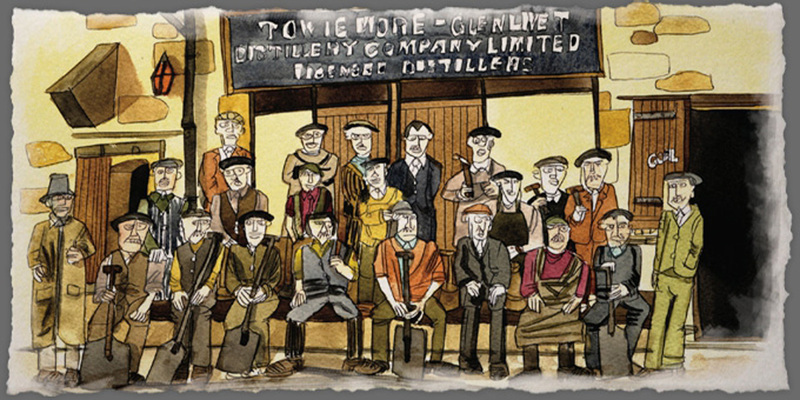 Towiemore Distillery 1817-1931 – an artists’ impression. By Adrian B McMurchie. Such troubles would have seemed distant when Towiemore opened in 1897. Built by local contractor W. Cruickshank on the designs of the architect John Alcock, both based in the town of Keith, Towiemore was instigated and bankrolled by Peter Dawson, the distiller, blender, international businessman and public relations pioneer. The location chosen by this native of Banffshire is indicative of the attributes required for a late Victorian distillery to succeed. Towiemore lay in the flatlands of a cultivated valley between the distinguished whisky towns of Dufftown and Keith. The name is thought to derive from either Gaelic ‘Tulach’ (hillock) or ‘Toll’ (a hollow/hole) and ‘Mor’ (large or big). This is potentially in reference to the deep quarry area through which the Towie Burn,a water-source claimed exclusively for the distillery, flows as a tributary to the river Isla. Towiemore Distillery was developed to straddle the Keith & Dufftown railway, built in 1862, with two acres of land specifically stipulated for the Great North of Scotland Railway Company (GNSR) to build a siding. By the time of Towiemore’s inception, the importance of an excellent water supply and dependable transport links were already well known. As distilleries in the Speyside region had already been established around the eponymous river to use its water, so distilleries situated themselves next to railways to ensure quick distribution to the blending centres of Leith and Glasgow. Towiemore was one of 40 distilleries built in the 1890s, 21 of which were built in Banffshire and Moray alone. Nearly all of these were situated on, or very close to, major arterial railways. Towiemore used its rail links to bring raw ingredients such as barley, yeast, peat and coke to the distillery and to send matured whisky to the blenders. Distilleries that did not adapt to the new industrial landscape soon struggled to survive. Built as the 1890s whisky boom came to a halt, Towiemore existed in one of the most tumultuous periods for the whisky business. Within weeks of Towiemore’s completion, the whisky industry was beginning to show signs of failure. The Pattison crash of 1899, instigated by the collapse of the influential Pattisons Ltd, left a web of broken businesses throughout the whisky industry. It destroyed consumer confidence in the blending industry, casting doubt on its legitimacy, and was a major financial scandal. Distillers, merchants and investors caught in the excitement of the boom could only scramble to save what they could of the industry, but for many businesses old and new the damage was too severe. Nevertheless, Towiemore distillery was taken under the control of the Towiemore-Glenlivet Company Limited, with Peter Dawson as its Director. Towiemore- Glenlivet was incorporated as a joint-share company on the 25th November 1898 with a capital of 50,000 shares at £1 each. These shares were split into 25,000 fixed preference shares and 25,000 ordinary. The success of Towiemore’s flotation was viewed as a notable success for the period, due in part to the relatively small amount of shares released. Peter Dawson, a native of Glenrinnes, was originally a grain merchant (registered as a ‘seedsman’ in the 1881 census). As a grain merchant he would have dealt with distillers and blenders; as a businessman he would have seen the potential value of turning his grain into spirit. Dawson owned Auchnagie distillery, the first ever release by The Lost Distillery Company, where he learned the whisky trade, built Convalmore in 1893 and was a director of Scottish Malt Distillers. Convalmore was one of the original ‘Seven Stills of Dufftown’ along with Balvenie, Dufftown, Glendullan, Glenfiddich, Mortlach and Parkmore. Dawson’s credibility as a distiller and blender was outstanding; he won gold medals at Great Exhibitions in Paris, Herefordshire and London, and an Award of Merit at the ‘First Distillers, Brewers and Allied Trades Exhibition’ held in Dublin. An acute and successful businessman, Dawson was sensitive to the trends of the whisky industry; he built during the boom years of the 1890s and contracted when business dwindled before, during and after the First World War. It was a period where ‘everybody thought they could deal in whisky’ although few managed it successfully. After Towiemore lost its blending contract in 1922, Dawson was quick to see the potential salvation offered by Distillers Company Limited in an otherwise doomed market. He eventually retired with his wife to Perthshire, where he died in 1938 at the age of 84. A rich and famous man upon his death, Dawson left a substantial estate worth £249,728 (over £10million today) to his heirs. Spain, and any bottle produced by Dawson featured the Monarch’s seal. Dawson’s whisky was also selected for the pleasure of the Prince of Wales, later George V, on the maiden voyage of HMS Indomitable to Canada in 1907. In 1910, Captain Scott chose Towiemore as his spirit of choice for his Terra Nova expedition to the South Pole; he took six cases of Towiemore with him. Such sponsorship arrangements for explorers were not unusual; indeed, they were key sources of funding and stock for expeditions. For the distillers, they were able to bask in the enormous coverage received by the explorers. Ernest Shackleton was sponsored by MacKinlay’s, while Roald Armundsen favoured Lyshomer Schnapps. Towiemore flourished, its spirit to be found in every corner of the British Empire. Its taste was that of a flavourful refreshing Speyside, light and fruity. Towiemore was said to be worthy of ‘the respect of the connoisseur, the confidence of the casual consumer and the rehance of the trade.’ Additional warehouses were built in 1902 to support increasing stocks of mature whisky, but the distillery was to suffer damage. ￼￼￼Dawson was a master of publicity, his talents suited to selling in the new world markets opened during the 1890s. In 1890 Dawson blended the biggest vat of whisky ever mixed before. The vat, with a diameter of eighteen and a half feet and a depth of eight feet, was held together by eight iron hoops weighing 1 cwt each and contained 25,370 imperial gallons of whisky from twenty five different ‘first-class stills.’ The overall weight was over sixty tons! Dawson was appointed purveyor of Scotch Whisky to Alfonso XIII, the King of ￼ in 1904 due to a fire, losing a window and forty quarts ￼￼￼￼￼￼￼￼(approximately 10 imperial gallons) of malt. The summer of 1908 saw considerable improvements to Towiemore during the quiet season. From May 1911 to June 1912, Towiemore produced no whisky due to the industry’s dire outlook, despite record demand for Towiemore’s product. Had Towiemore produced in that year it would have done so at a loss. Towiemore produced again the following year, but continued to lose money against the cost of production. The reason given at the time was that the price of barley was so high that there was hardly any profit to be made on the whisky. Towiemore was not the only distillery to complain of such a problem. Production continued during the First World War at a diminished rate until malt whisky production was nationally halted in 1917. Towiemore survived the difficulties of the post-war period, restarting production and actively hiring more workers. However, problems soon followed. A series of Extraordinary General Meetings privatised the Towiemore-Glenlivet Company in 1821. The main buyers of Towiemore, as with all malt distilleries, were the big blending firms, but in 1922 they stopped purchasing Towiemore due to concerns about an influx of lime into the water supply. Without the support of big blending, the market for Towiemore spirit dried up. Towiemore was amalgamated, along with many other distilleries, into Scottish Malt Disitllers in 1925 via a take-over by Buchanan-Dewars. This deal was the first piece of public business announced on radio by the BBC. The signatures of the board of directors are a roll call of big whisky in the period. Shareholders included Sir Alexander Walker of John Walker & Sons, The Honourable John Dewar of Dewar & Sons, Thomas Herd of Distiller’s Company Ltd and William Morrison of W.P. Lowrie & Co. The whisky industry was undergoing a necessary retraction after many years of over-production and over-competition, and many distilleries were viewed as expendable. In this climate of contraction Towiemore was clearly vulnerable. Five years after its amalgamation with DCL, Towiemore-Glenlivet Company tendered its declaration of insolvency on the 1st July 1930 as part of a voluntary winding up petition. By this point, Towiemore was one of 26 Highland distilleries owned by SMD, 44 malt distilleries in total plus 7 associated. SMD took control of all stocks and equipment as part of the liquidation process. This included £5,065/6/3 in stocks and £22,865/19/0 in cash with a total asset value of £30,640/12/18 absorbed by SMD. Only the distillery premises were required, so the stills and other equipment were stripped and requisitioned for Dalwhinnie Distillery, which had been completely destroyed by a fire in 1934. The remaining malting and warehouses were still in fine working order, so SMD turned the site into an industrial malting for its remaining malt distilleries and utilised the huge warehouses to mature stock. Casks of new make from SMD distilleries arrived by road to mature in bonded warehouses before departing by rail to Glasgow. Spirit stocks wore down during the Second World War with no national production, leaving vast, empty warehouses. These were used to billet troops who came North for training. The malting continued after 1945, and in 1957 a new maturation shed was built with an asbestos roof. This structure still survives today. Usage of the distillery site for whisky ceased in 1993, when the malting barns and older bonded warehouses were dismantled. Slates and pine beams were recycled and used in the construction of Cardhu’s visitor centre, while L.H. Stainless Steel now uses the still house and filling store to produce, among other things, stills. Towiemore used water from the Towie Burn, a source claimed exclusively for the distillery, which flows through a scenic cleft of woodland originating from the Hills of Towie. A dam was built within this woodland to control the flow of water to the distillery, but this was destroyed in 2005 to ensure salmon could travel up-stream. The land through which the Towie Burn meanders, and which the Towiemore Distillery lay upon, is known to be part of a huge lime seam that stretches from the coast of the Moray Firth to Tomintoul. Many sought their fortunes in this area by building quarries and lime works to convert limestone for agricultural or industrial purposes. One of these men was William Grant, who after failing to establish a lime works in nearby Drummuir moved to Dufftown to begin a distillery. This distillery was Glenfiddich. Lining the Towie Burn were several of these lime works. This highlights the high amount of lime in the area, and indicates the type of rock the Towie Burn filtered through before it reached the distillery. This prior filtration meant that the Towie Burn, like most ￼￼￼￼￼￼￼￼￼water sources in the immediate area, supplied alkaline water naturally diluted with dissolved calcium. Alkaline water is not unknown in whisky, but it is uncommon; most distilleries use lightly acidic water, as did the blending centres of Leith and Glasgow. ￼￼￼￼￼￼￼￼Banffshire Herald, 25th September 1897. The Towiemore Distillery, on the Drummuir Estates, which has been contracted to Keith tradesmen, will be an extensive establishment, provision being made for manufacturing 3,000 bushels per week. For Towiemore’s alkaline whisky, for many years the differentiation in PH did not cause any problems. The spirit produced at Towiemore was known as an excellent single malt, particularly at cask strength, and was a staple part of many blends. It may have been that at this point the water supply was only lightly alkaline, siding on neutral, and was not of weak enough PH to cause any reaction when blended with acidic whiskies. However, between the closure of the distillery in 1917 and the emergence of the distillery’s new three-year- old whisky in 1922 (after production restarted in 1919), something changed in the make-up of the whisky. When acidic water was added to cask strength Towiemore, the affect was similar to when the same is done to Pernod or Ouzo – the spirit momentarily fizzed. This also happened when the whisky was watered down to 40% ABV or when Towiemore was mixed with acidic whiskies during the blending process. Although the fizz only lasted for a short time before returning to normal, the affect was enough to chasten the large blending firms who were looking to reduce their output in the post-war period. As a result, in 1922 the major blenders rejected Towiemore as a malt component for use in their blends. This was a terminal blow for Towiemore. Experiments with filters and other contraptions failed to alleviate the problem, and Towiemore never regained the support of the blenders it desperately needed to survive. The sudden impact of the fizziness upon the whisky when mixed with water or during the blending process is consistent with a sudden influx of alkaline elements into the water supply. It could have only been a temporary contamination, perhaps affecting a few months output, but the nature of whisky making means that such a problem may not be noticed for many years. The most likely culprits were the lime works that dotted the banks of the Towie Burn. The Burn was an obvious discharge point for any industrial waste, and all it would need is a few months of washing excess lime down the Burn or heavy rain to do likewise and the distillery’s precious water supply was compromised. Towiemore in this instance was unfortunate. The water of Towie Burn was safe for human consumption, as was the whisky. By itself, Towiemore was a sumptuous single malt of creamy, lingering taste. However, the natural alkaline make-up of its water supply meant that Towiemore worried the blenders, the only men who mattered in this period. As a cask strength single malt today, it would have proven popular. Tasting notes from the period describe it as possessing ‘excellence of quality and individuality of character.’ In 1924, a George Ballantyne & Sons grading list placed Towiemore on par with the renowned Glenmorangie for use in their blends. An SMD blending list from 1954 shows that Towiemore was still being used in blends nearly thirty years after production halted. Towiemore was not the only distillery from the period to be adversely effected by the lime content of the water. Parkmore Distillery, whose huge remains near the outskirts of Dufftown are a relic of Victorian- era distillation, was founded in a similar period to Towiemore and immediately faced severe problems with its water supply. Unlike Towiemore, Parkmore’s whisky did not enjoy a great reputation. Calcium contamination was so bad that the copper pot stills were said to resemble a London kettle! Towiemore was blessed with an abundance of all the necessary natural materials needed to produce whisky: barley, yeast and water. Bere, popular with distillers of the period, grew in the local area, and Towiemore was able to utilise its rail connections to bring in barley from further afield when the need arose. The first barley malted at Towiemore came from Younger’s Ltd Maltsters, Edinburgh. Bere was volatile but flavoursome; it was the industry’s barley of choice until the emergence of Chevalier in the early twentieth century. Towiemore would have gained sweet, cereal flavours from the use of bere. A correspondent to the Aberdeen Journal noted in 1899 that barley at this point was very good and very cheap, and therefore if trade had been good then the distillers would have made great progress in production. ￼￼￼￼￼￼￼￼￼Barley was a huge commodity for the farmers of the Highlands, and their fortunes were closely tied to those of the distillers. 54% of barley grown in the nine Highland counties went to distilling, whereas in the major distilling districts of Banff and Moray the figure is even more striking. In the 1920s, 84% of barley grown in these two counties went directly into the distilling industry. A close relationship between farmer and distiller resulted in neutral gain. Farmers were willing and able to buy the draff produced from the mashing process to feed their livestock. Towiemore utilised a two-storey attic malting floor to malt its barley before it was dried on a perforated floor above a large kiln, with provision to ‘manufacture’ 3,000 bushels of barley per week. The kiln was fired by a mixture of peat and coke, brought in from Tomintoul and further afield via the rail network. The peat would be burnt first for a short time so as not to impinge too much of its smoky flavour upon the malt, whereupon flavourless coke was heaped on top of the peat to finish the process. Although not powerful, wisps of smoke would have made it into the Towiemore whisky. In 1904 the kiln could dry forty quarts of malt at a time. Firing the kiln could be dangerous work. A stray coal set alight a dry pile of peat near Towiemore’s kiln, and only the quick thinking of the distillery workers halted a disaster. Towiemore’s malting process was supported by the addition of twin ventilated pagoda chimneys, probably in 1908, as pioneered by Charles C. Doig. Doig’s ventilators encouraged the kiln’s hot air to spread upwards, resulting in a more efficient malting process. The malting floor at Towiemore was effective enough to warrant usage by Distillers Company Limited after the closure of Towiemore’s distillation plant before it was eventually shut down in 1964. Mashing first took place at Towiemore in November 1898. Grist (dried malt barley ground in a Malt Mill) would be mashed slowly with fresh water from the Towie Burn to create a highly saccharine wort, rich in maltose ready to react with yeast in the large washbacks. Towiemore would have used a large wooden mash-tun with a revolving arm for stirring the mash as sugar was extracted from the malt. ￼￼￼￼￼￼￼￼￼￼￼￼￼￼￼￼￼￼￼￼￼￼￼￼￼Towiemore’s staff gather before the first malting. By Adrian B McMurchie. ￼￼The distillation process was handled by a crack team of distillery workers headhunted by Peter Dawson to produce Towiemore’s flavourful spirit. George Cruickshank, a mashman of Macallan, was hired as a Manager at Towiemore. Towiemore’s Distillery Manager and Brewer, John Wiseman, was also appointed after a stint at Macallan and Peter Dawson’s other distillery, Convalmore. Production at a late-Victorian era distillery involved intensive manual labour, even though the distillation process was improved by the addition of steam engines and other machinery. After mashing was complete, the wort was transferred to several washbacks where it was left to ferment with liquid yeast. These washbacks were likely to have been made from Oregon pine, a sturdy wood still used to make washbacks today due to the straightness of its growth. Until the late 1860s usage of yeast by distillers had ranged from wild yeast to brewers yeast from which the distiller cultivated their own strand. Yeast therefore varied in strength, purity and type, and was highly prone to volatility, mould and bacteria; it was not unknown for washbacks to explode as a result of high temperatures over-reacting the yeast. Vienna Yeast, a more reliable product that could be compressed for ease of transportation had proved a popular import from the European continent. DCL saw the potential profit in regulating yeast production to improve the efficiency of the large-scale distillation process. They therefore invested heavily in improving the quality of British yeast. This process began by funding the experiments of Dr W. Squires, who offered DCL his own patent version of Vienna Yeast in 1881. Squire’s process utilised the well-known chemical properties of dense mashes to produce a better result than standard Vienna Yeast. Vienna Yeast manipulated the mashing process through higher temperatures and thicker mashes. DCL’s British-made transportable Vienna Yeast, gathered by grain distilleries such as Kirkliston, was a huge success and profitable to the extent that a subsidiary, United Yeast Company, was formed in 1899. It is from United Yeast Company that Peter Dawson would have sourced his yeast for the Towiemore fermentation process. Although still a quickly perishable product, this new yeast resulted in more reliable production while producing important flavour compounds, such as citrus, for the Towiemore whisky. Towiemore utilised two copper pot stills, a wash still and then a pot still, to distil its wash into spirit in the traditional batch distillation method. Coal fires heated the underneath of both stills, while a rotating scour prevented burning on the inside of the still. Towiemore’s wash still had a capacity of 17,000 litres while the spirit still could contain 16,000 litres. Both were of medium build, with slightly long necks and a gently ascending lyne arm. The ascension of the lyne arm caused more reflux, resulting in a lighter spirit resplendent with nutty flavours. Copper, then as now, was used to build stills due to its heat transferring capabilities and ability to separate flavour-enhancing congeners. The spirit would then descend through a wooden worm tub, where it would cool and condense as fresh Towie Burn water flowed around the spiralling tube. Towiemore’s fresh new make spirit was filled predominantly into Sherry Butts, although Hogsheads and some plain oak casks were also used to offer a slightly different variations in character. These casks were stored in a ten-bay range of single storey bonded stores of the traditional style. Once sufficiently matured, these casks were transported by rail to Leith and Glasgow, or to grocers to be sold singularly in the local market. In 1902 Dawson sent an order of eighteen wagons full of casks to Glasgow. This was probably the first batch of Towiemore! Aberdeen Daily Journal 4th november 1902. There was forwarded last week from Towiemore Distillery to ’Mr. P. Dawson, 82 Great Clyde Street, Glasgow, a large consignment of whisky requiring 18 waggons to accommodate it. Before starting the train was photographer by Messers Wood and Hendry, Dufftown. Mashing operations were to have been resumed at the distillery yesterday. The Towiemore spirit contained in these casks was a distinguished whisky of mid-to-long finish. Cereal notes are present on the nose due to the use of flavoursome barley, with a hint of earthy heather and smoke caused by local peat. The Towie Burn produced a smooth base for the whisky, full of minerals. Vienna Yeast ensured Towiemore was infused with a citrus zest, while the long necks and ascending lyne arms of the stills embodied the whisky with a long finish of walnuts and almonds. Maturation in Sherry Butts ￼￼￼produced a surge of creamy sherry taste coupled with lucid notes of fruitcake and sweet spice. When the first ground of Towiemore was broken in 1897, Peter Dawson would have congratulated himself on the choice of an excellent site to begin production of malt whisky. With superb transport links, a proven market and a plentiful water supply, along with a crack team of experienced workers, Towiemore had everything necessary to flourish into an enduring distillery. Towiemore’s closure little more than three decades later was long in coming but must have seemed inexplicable to Dawson. ￼￼Banffshire herald 12th November 1904. Fire at a Distillery – On Sunday morning about ten o’clock it was discovered that fire had broken out at Towiemore Distillery. A live coal had fallen out of the hearth of the kiln and ignited a large quantity of peat which were lying beside it. Fortunately three of the employees were at hand, Messers Christie, Milne, and MacDonald, and applied the fire hose, and, with a plentiful supply of water, got the fire under control. The fire did no damage to the building, with the exception of a window, which was entirely burned. About fifty quarters of malt which were being dried on the kiln at the time were destroyed, but for the prompt action of the employees there would no doubt have been a disastrous fire. Although it produced excellent, light and sweet Highland style whisky popular both as a pure malt and for blending, Towiemore’s opening coincided almost exactly to the point the industry was swept into disaster, entering a malaise that was not to cease until long after its closure. The amalgamation process may have saved the whisky industry, but it was not enough to save the unlucky Towiemore, its brand cast into the annals of whisky history.